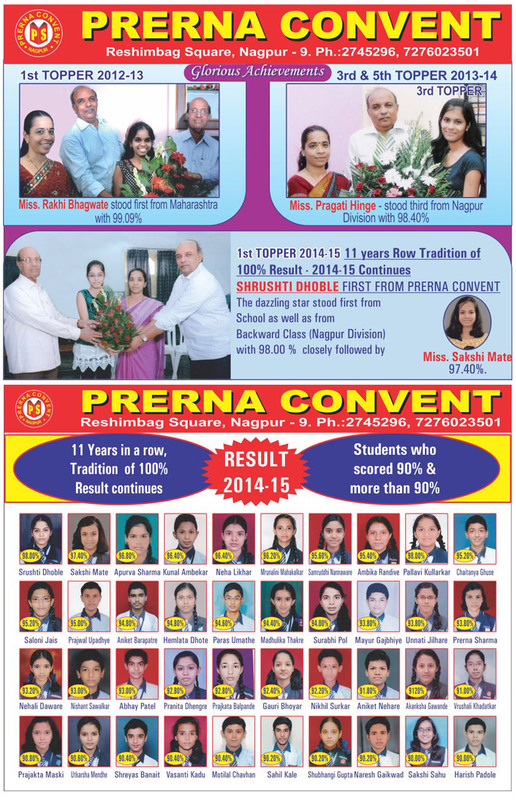 The Student of Prerna Convent brought laurels to the school by giving 100% result and maintained this glorious tradition of last 10 years. The dazzling start of Prerna Convent Miss. Pragati Prakash Hinge stood first from School with 98.40% closely followed byMast. Tanmay Rewatkar with 98.00%, Mast. Akhil Sontakke stood 3rd with 97.00%. This year 72 students appeared for SSC examinations. Out of which 15 students scored above 95%, 43 students scored above 90%. President Prof.R.C.Gulhane, Secretary Dr.S.C.Gulhane, Head Mistress Sanyogita Patil & Staff congratulated Miss. Pragati Prakash Hinge as well as other students to repeat the feat of their seniors in future.